Peter Paul Rubens’ oil sketch Achilles Educated by the Centaur served as the second of an eight-piece series of oil sketches that chronologically told the epic tale of Achilles. While most centaurs were notoriously uneducated, drunk partiers who possessed relatively few manners, the depicted Chiron led a much more refined life. He made a living training epic heroes. Chiron the centaur taught a laundry list of heroes that included Hercules, Theseus, Ajax, and Jason of the Argonauts. 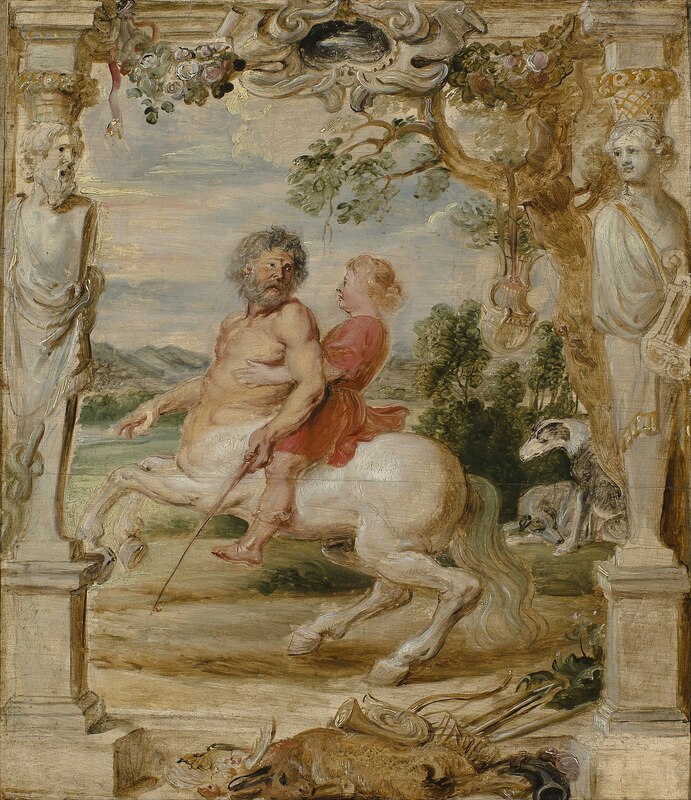 In this work, Rubens depicted Chiron training a young Achilles. Amazingly, Chiron was actually Achilles great grandfather. It’s pretty rare to get lessons from your great grandfather in music, horseback riding, hunting, and poetry. And it’s even more rare for your great grandfather to be a centaur. Most of us consider ourselves lucky to meet our great grandfather, or if we are really lucky, to get a ride on his electric wheelchair. Oil sketches like this one were the first step toward the final product - a series of woven tapestries called The Life of Achilles. Rubens often used oil sketches as his prototype for future paintings, but in this case, the sketch served as the foundation for a tapestry. In order to turn the sketches into tapestries, an assistant had to first paint a ten-times larger version of Rubens’ sketch. The weaver then worked from this enlarged model. In this case specifically, the weaver used an expensive silver thread that was most likely paid for by the commissioner. The commissioner was most likely Rubens’ father-in-law, Daniel Fourment, whose home the tapestries were discovered in. Nice and thorough guy that he was, Rubens always made sure to take the size of the room and where the tapestries would hang into account when putting together tapestry projects like this one. Talk about a tightly-woven relationship with your father-in-law. Rubens took great personal interest in the hero Achilles, and as a result, these tapestries include details that honor the literature behind the myth - like the god Aesculapius and the muse Callipeo who are carved into the columns. You could say Rubens was one of the rare humans capable of adapting their art from literature - don’t even get me started on the disgraces that the Lord of the Rings or Harry Potter movies are to the original texts. But despite Rubens’ careful attention to literary details, critics still discovered an achilles-heel-of-a-mistake in Rubens’ tapestries: In the first tapestry of the series, Achilles’ mother baptized him in the river Styx by holding onto his his left leg. In the last tapestry however, the arrow strikes his right leg, not his left. Homer, and Pauline Francis. Illiad. Evans Publishing Group, 2012. "Peter Paul Rubens: The Life of Achilles." Historians of Netherlandish Art Reviews. Accessed August 15, 2018. https://hnanews.org/hnar/reviews/peter-paul-rubens-life-achilles/.